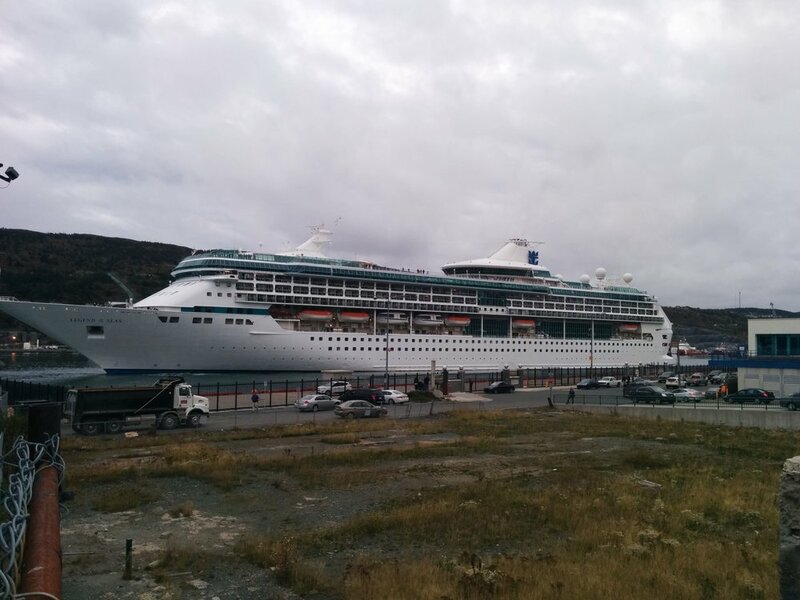 M/S Legend of the Seas in St. John's. Photo by Heather Elliott. One of six ships in the Vision-class, and sister ship to Splendour of the Seas, Legend arrived bright and early on Wednesday morning. It was great that she was able to get in safely after cancelling her first scheduled visit back in September. Equipped with numerous pools, bars, clubs, and a rock climbing wall, the Legend is speculated to be one of the most travelled ships in Royal Caribbean's fleet. She is said to have visited ports in Asia, the Mediterranean, Europe, North and South America, the Middle East, and many more during her almost 21 year career. Like most other cruise ships that we've had visit, she tends do to the Baltic and Norwegian cruises during the summer, sailing across the Atlantic to do Caribbean ventures in the winter. Her previously scheduled visit would have been made during her Norway-to-North America crossing. Her stop in St. John's was part of a 10 day Canada cruise that saw her visiting ports in Quebec, Saint Pierre-Miquelon and Nova Scotia as well. She is due to return to St. John's on the 17th, which will be the last cruise ship visit of the 2014 season. Setting sale from St. John's. Photo by Heather Elliott. Unfortunately that's all I have for this week. Have a wonderful weekend all of you, and for my fellow Canadians, happy Thanksgiving!! Images this week were my own.